There`s more than just silver shops in Taxco. It`s considered a national monument and UNESCO patrimony because of it`s colonial history and architecture. Drive through the mountains and see how silver and gold are converted in to jewelry. 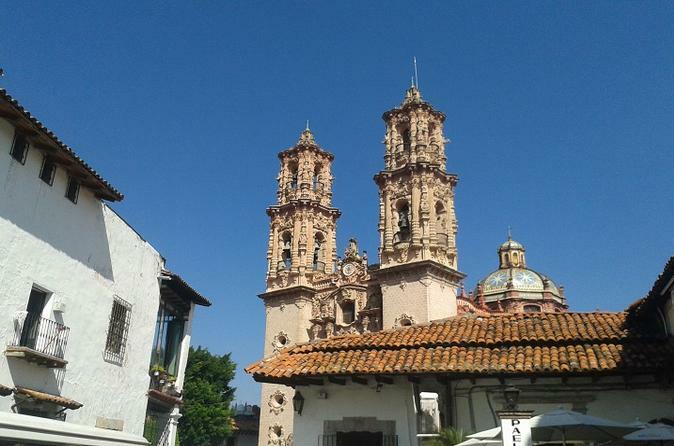 Visit Taxco city and admire historic places and monuments. The tour departures from Acapulco and lasts 14 hours, during which time you will visit the city's main attractions. The name Taxco is most likely derived from the Nahuatl place name Tlachco, which means "place of the ballgame." However, one interpretation has the name coming from the word tatzco which means "where the father of the water is," due to the high waterfall near the town center on Atatzin Mountain. "De Alarcón" is in honor of writer Juan Ruiz de Alarcón who was a native of the town. Like many municipalities in central Mexico, the municipality’s coat-of-arms is an Aztec glyph. This glyph is in the shape of a Mesoamerican ballcourt with rings, players and skulls, derived from the most likely source of Taxco’s name.